Diners will have a chance to sample three Michelin starred Spanish food from esteemed chef Paolo Casagrande for three days at Tosca in the Ritz-Carlton. The Italian born and trained chef, found his culinary calling cooking under Spanish master Martin Berasategui and this partnership recently earned them three stars at Berasategui’s Lasarte Restaurant in Barcelona. 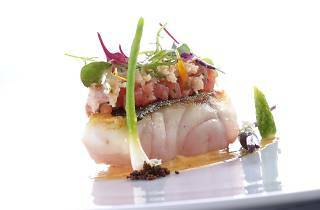 Chef Casagrande will cook up Basque and Catalan inspired dishes with Italian accents, such as amadai fish with iodised sauce, king crab and raw tomatoes, saffron and sea urchin with white truffle risotto and espelette pepper and cockles. White truffles can be added to any dish for $680. Lunch: Midday-2.30pm, 4 course $888, 5 course $988. Dinner 6.30pm-10.30pm, 8 course. $2480.